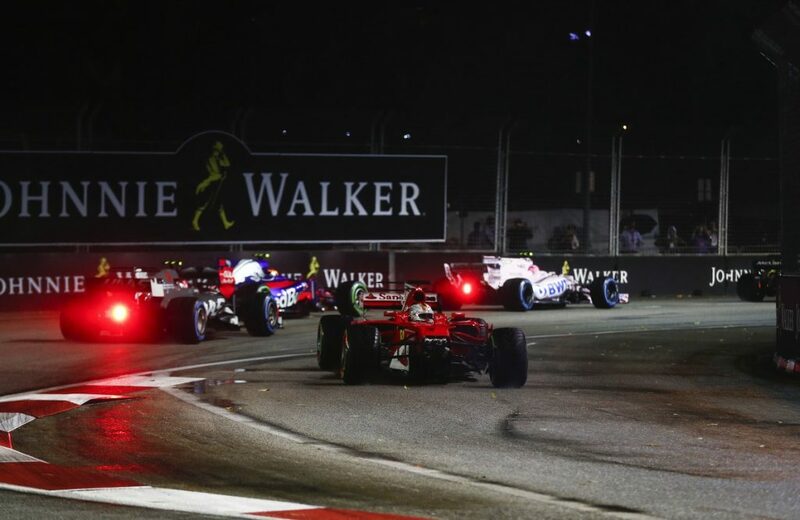 An unbelievable start to the Singapore Grand Prix damaged Ferrari’s hopes of a much needed win as Lewis Hamilton was all but handed victory. It was meant to be the weekend Vettel regained the championship lead with Ferrari and Red Bull looking good. It was all going to plan as Seb took pole under the lights with the Mercedes pair in 5th and 6th. 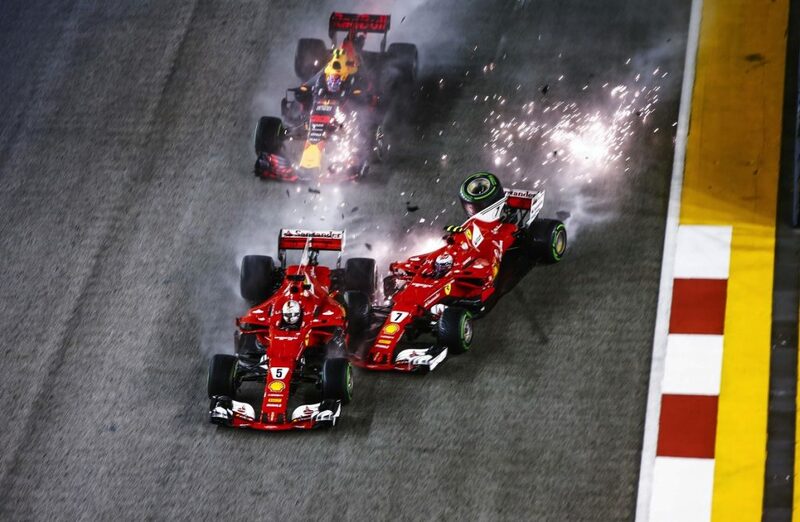 But disaster struck as the two Ferrari’s sandwiched Max Verstappen and had an almighty crash going in to turn one that ended the race for all three of them. Let’s get this out of the way before we talk about the rest of the weekend. The finger of blame was quick to be pointed at different culprits for the start but in the end most seemed to agree that it was a racing incident. It certainly wouldn’t have happened if Vettel had not moved over to cut off Max but how was the German to know that Raikkonen had made such a fantastic start, speeding up the inside. So although some may believe the fault lay with one of the Ferraris (or even both of them), I do believe this is a harsh assessment. A bit careless maybe, but that is the nature of Formula 1, especially in wet conditions on a street circuit. 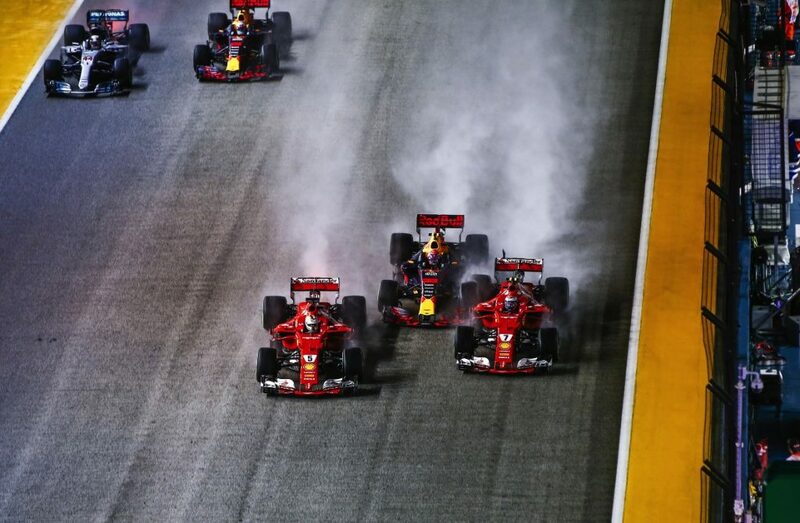 Talking of that circuit, it seems Singapore have really put a lot of effort in to hosting the race once again this year. It is always one of the most spectacular looking grand prix on the calendar and it looked it again. After ten years in F1, it looks like it is now a permanent fixture and long may it continue. Heading to the Far East, there was plenty of news flying around the world of F1 including an agreement finally being made between McLaren and Honda to split. McLaren have been awful this year under the Japanese manufacturer and it has left Fernando Alonso and a lot of his fans very disappointed. A driver of his class should not be dragging a car kicking a screaming just to see if he can make it round in one piece. He will now be driving a Renault engine, the same company that brought him his two world titles, from 2018. That isn’t the end for Honda though, who will try and make amends with Toro Rosso next year. They will do it without Carlos Sainz who moves to Renault. The big sister of Toro Rosso, Red Bull are also in the mix for a new engine supplier and after being heavily rumoured that it will either Porsche of Ford, this was shut down by team principal Christian Horner with Aston Martin looking the favourite now. That is very exciting! Back to the race weekend and a qualifying that was looking like it would be a battle that wouldn’t include a Mercedes. The Ferrari’s were hoping to be quicker and the Red Bulls were flying round the track in practice, Verstappen topping P3. After some problems with tyre temperatures on the Mercedes, Sebastian Vettel pulled it out of the bag and qualified pole, just ahead of both Red Bulls. In what was a strange sight, both Mercs were on the third row. Surely a great opportunity for Vettel to retake the championship lead and Red Bull to get some podiums and maybe a race win for themselves. But that all came to a dramatic end going in to turn three. As Raikkonen and Verstappen went crashing out of the race, Hamilton found himself in second and suddenly he was in the lead. After being caught up in the earlier collision, Sebby spun out a couple of corners later. He crashed into the barrier and lost his front wing. The German’s race was over and Hamilton was handed the victory. Lost in all of the mess was Alonso’s incredible start which saw him momentarily go in to 3rd before he was pushed aside and flipped by the Red Bull of Verstappen. He carried on for a while but after ten laps the car couldn’t go on with the damage sustained. All of the action at the front had meant opportunities further down the field. Lance Stroll continued to impress in wet conditions, making up 10 places in his Williams to finish 8th. There was a real battle for 4th for quite a while though as Sainz and Nico Hulkenberg had a good tussle. With the pair soon to be teammates it would be interesting to see who would get the upper hand, this time it was the Spaniard. He had a fine race and controlled the car superbly, bringing it home in 4th, his best ever finish. The man he is replacing, Jolyon Palmer, has had a tough season, but he at least made a claim to be given another chance in F1 with his personal best of a 6th placed finish. There were a few incidents, as expected, during the race that brought out the safety car. The second was significant as Marcus Ericsson spun near the tunnel, delaying the race just enough to make it a timed race. After his earlier exploits near the podium, Hulkenberg had some issues with his car that saw him retire early, as did Kevin Magnussen who was having his own battles at the bottom of the point places. But in the end the podium had a familiar feel about it. 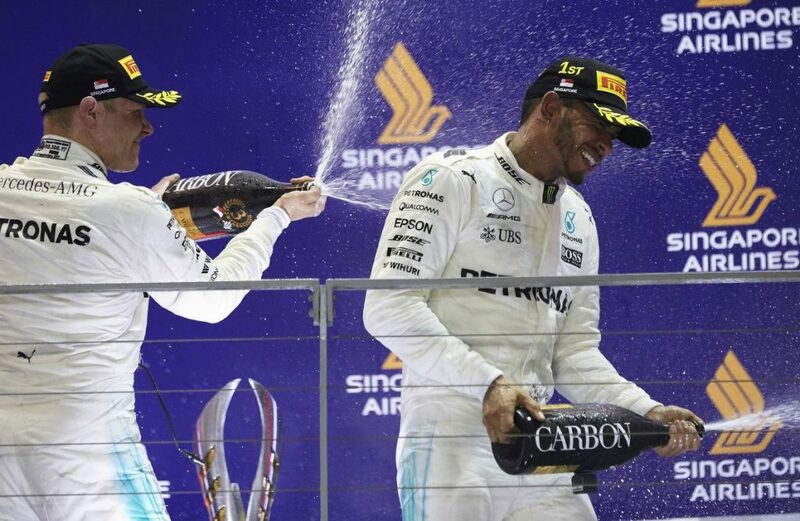 Hamilton was on the top step, extending his championship lead to 28 points. His teammate Bottas was 3rd, helping Mercedes to a healthy 102 point gap over Ferrari. 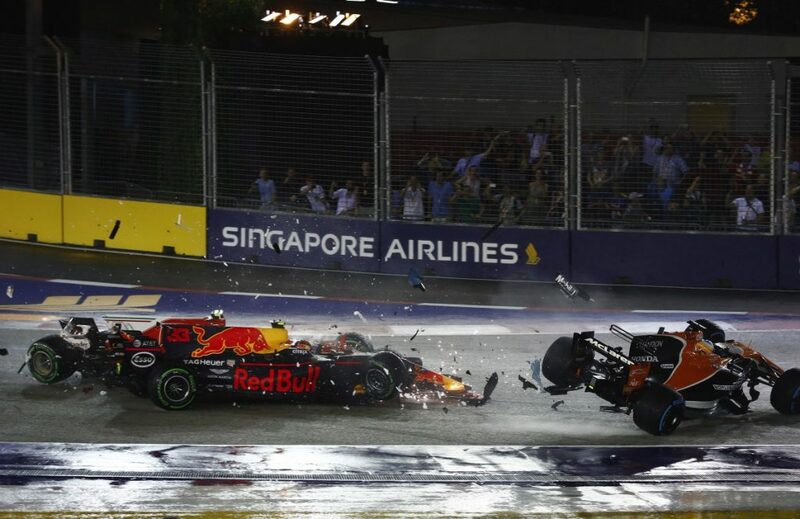 It was very familiar for Daniel Ricciardo who for the third consecutive year finished runner up in Singapore. In the end it was a disastrous weekend for Ferrari. Both cars out, Mercedes getting two cars on the podium and Hamilton gets the win. Sebastian has came back from worse than this, three points worse in fact in 2010. It will be a bit of a mountain to climb but this could be a pivotal moment in the season. We will see come late November.